Ultimate Combo using only the best components at the best prices. Great for forced induction, N/A, nitrous applications or any modified motors that see high rpm use. These proven parts are much stronger than the oem components and must be used in any serious engine build. Don't wait till they break, trust us!! The weakest link for any performance build is the OPG, Crank Sprocket Gears and the harmonic balancer. We highly suggest you change these components before adding superchargers, turbochargers, nitrous systems or heads/cams packages. As power levels and rpm increase, so do the harmonics of the crankshaft. As these harmonic levels increased, ultimately the powdered metal oil pump gears proved too brittle to survive the abuse. Canceling harmonics is important, so in addition to the upgraded billet oil pump gears, a quality crank damper is also recommended. Increased crankshaft harmonics aren’t the only problem. Some supercharged applications add so much load on the snout of the crank that it actually causes the crank to move just enough that the oil pump gears can bind, only worsening the problem. If you plan on significantly raising the rev ceiling or increasing the power on your Coyote, especially with a supercharger, then billet oil pump gears are more than just cheap insurance. They’re a must. The Coyotes spin a lot more rpm than the modulars, and big power levels are easily reached, so oil pump problems were more prevalent. 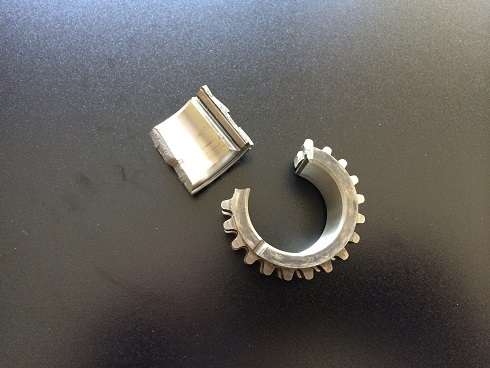 Back in 2011 we began seeing problems with the stock powdered metal oil pump gears shattering, especially on supercharged applications that utilized an inexpensive, aftermarket crank damper. The inner oil pump gear is lugged off the crankshaft, which means the crankshaft harmonics are passed through oil pump gears and into the balancer.